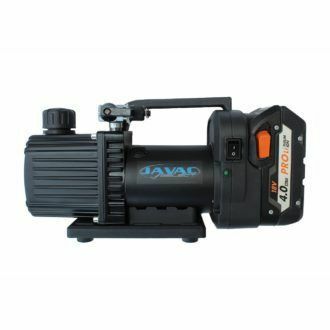 Perfect for technicians who require a lightweight portable vacuum pump for small or light commercial applications including automotive systems and residential air conditioning split systems. 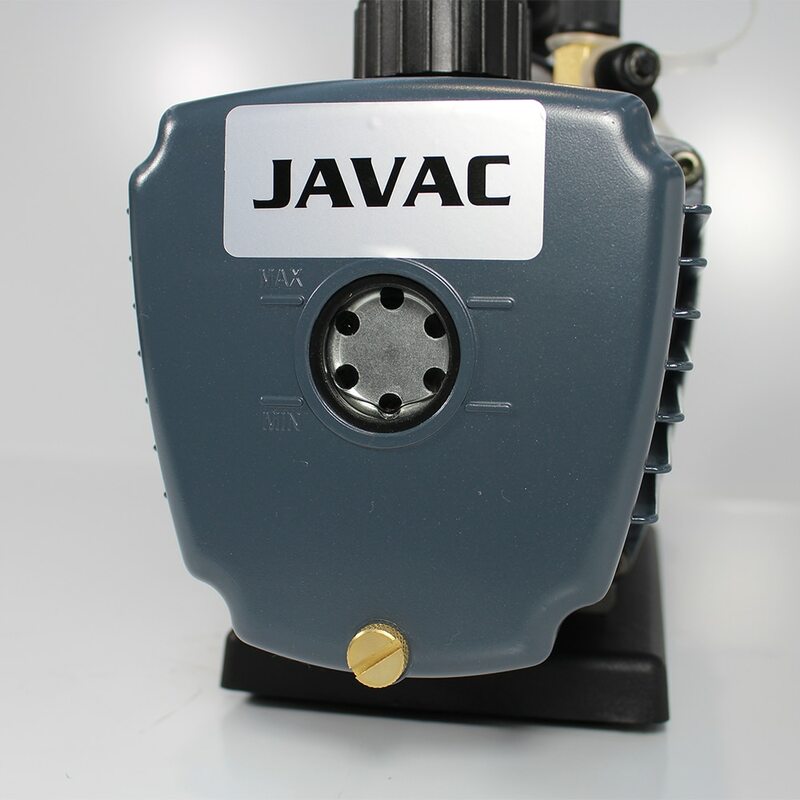 Highly durable and time-tested you won’t be disappointed with the quality of this JAVAC vacuum pump. JAVAC vacuum pumps have been engineered to provide reliable field service with heavy duty steel construction. They include a 2 stage motor, corresponding #15 vacuum pump oil, and a factory micron rating of 15 microns. 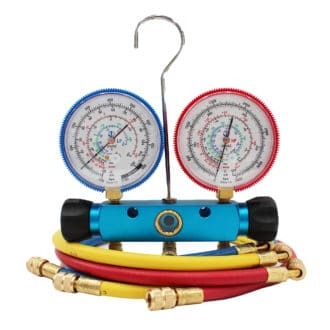 They are built for deep vacuum service on appliances, residential, and commercial systems using CFC, HCFC, and HFC refrigerants. This vacuum pump is extremely well designed and will last a long time if looked after. These vacuum pumps are designed to last and are suitable for refrigeration professionals who needs an everyday vacuum pump that can withstand the most demanding use. 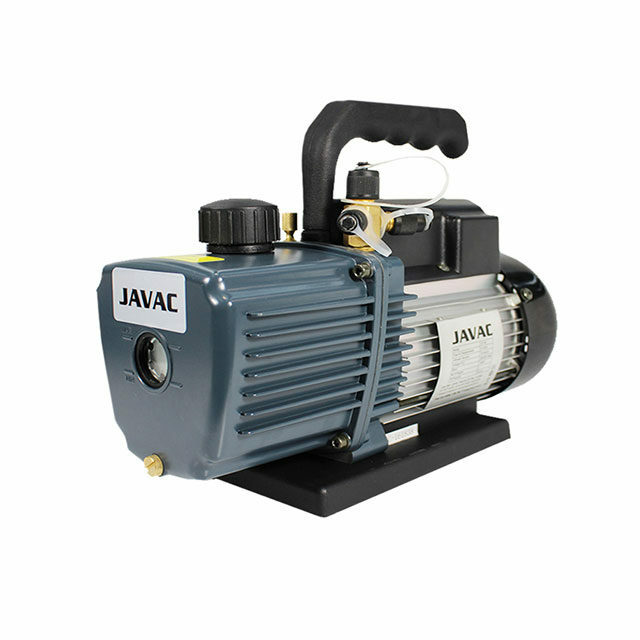 The CC series vacuum pumps work according to the rotary vane principle. An eccentrically installed rotor rotates in the cylinder. The centrifugal force of the rotation pushes the vanes, which glide in slots in the rotor, towards the cylinder wall. The vanes separate the sickle-shaped space between rotor and cylinder into chambers. When the chambers are connected with the inlet channel, gas is sucked in, compressed by the next rotation and pushed into the oil separator. Differential pressure constantly causes oil to be passed into the compression chambers. The oil and medium are then discharged into the oil separator and there separated from the exhaust air by gravity and the exhaust filter. Oil collects on the bottom of the oil separator and is passed into the compression chamber again (oil circulation). Why your pump needs genuine vacuum pump oil? It is extremely important to operate your vacuum pump using the correct viscosity oil, as those that are either too thin or too thick will cause damage and operational issues. Oil must always be changed when contaminated to protect the seals and internal parts of the vacuum pump. We recommend changing the oil regularly as it’s not just for lubricating the moving parts but creates the vacuum by sealing the sliding vanes. Oil contamination is usually indicated by poor vacuum reading, or a grey or milky appearance. Should liquids be accidentally allowed into the vacuum pump you must change the oil immediately. Not changing the oil can both shorten the life of the vacuum pump and can void the warranty.